OCEAN DREAM 1 BEDROOM LOFT CONDO IN HEART OF CLUB ZONE ON BEACH! Few minutes walk to TOP CLUBS, 2 malls and deluxe supermarket. Resort condo hotel offers 2 infinity pools, a snack bar, new restaurant, massage services and beach, surf school, free gated parking. Very safe, gated and secure with 24 hour security, lifeguard. Features: new eco friendly a/c, triple pane windows, black out curtains, granite counters , Google Chromecast TV, WIFI. Shower room remodeled mid October 2017, new doors, repainted Dec 2017. New double sofa bed and queen bed end of August 2018 and new single size sofa bed mid November. March 2nd 2019 we added a double air mattress (set up upon request). FRIDGE replaced, kitchen sink faucet replaced, new night table, new storage cabinets at end of October. NOTE:our condo hotel's lobby and services are for hotel guests. Even though we are in a condo hotel, private suites are not part of the hotel. Cleaning and laundry are done after your departure and for guests that stay for 5 nights or longer we provide free light cleaning every 3rd-4th day (includes 4 rolls of toilet tissue and clean towels). For guests who want hotel services, our hotel rents out its rooms or you can hire our housekeeper for more frequent visits/more frequent towel exchange. This is a vacation rental, not a hotel room. Guests need to bring beach towels. We do not rent to smokers even if they smoke "only outside". No los podemos acomodar si alguien es fumador, o toma alcool excesivamente. On ne peux pas vous loger si quelqu'un est fumeur, gros buveur. Designer, former RN, mom of 4, married to a prof. Chilean born, live in Canada. 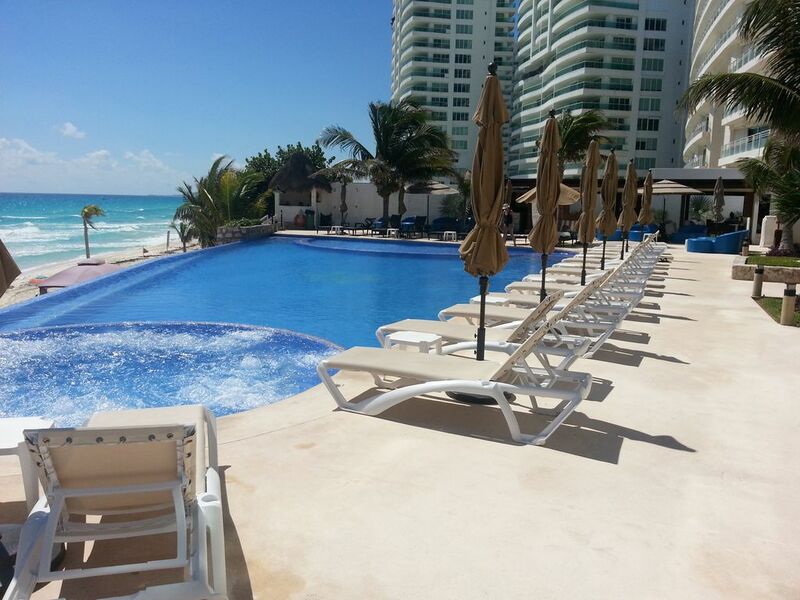 Unbeatable Punta Cancun location; clubs, malls, supermarket within minutes walk! Between Playa Gaviota Azul and Chac Mool. Shower, closet, fully remodeled shower/toilet room end of October 2017. August 2018 we added a rod and shower curtain. 1 new double sofa bed and 1 new single sofa bed. We have a playpen crib for children under 2 yrs of age and upon request a double air bed. electric dual cooktop, microwave, toaster, toaster oven, blender, coffee maker, kettle, all cooking/serving ware. 2 small tables (use inside or outside), 4 chairs, 2 bar stools, 2 small stools (stackable). Surfing school on site,next to upper pool. 2 new infinity pools, upper one has a shallow area and jetted area, lower one just opened Dec 11th 2017 and has a swim up bar. Both pools change colors at night. Pools close at 9pm. fish pond in atrium,, fire extinguisher in kitchen. MID AUGUST 2018: loungers/umbrellas on beach (Kane bar clients, minimum 300 pesos consumption). For guests staying 5 nights or longer we provide FREE light housekeeping, 4 rolls of toilet tissue and clean towels every 3rd or 4th day (ie stay 8- 9 nights, fourth day), stay 10 nights or longer every 3rd day. More frequent housekeeping/towel exchange or linen exchange available upon request (you pay housekeeper). Muchas gracias Alex, ojala regreses con tu familia. Our family of 5 stayed here on Last week of June 2018, space is too small definitely not big enough for more than 3. Not very clean, found bugs on the beds. Everything in the room should be updated, beds (broken, mattress are very old), kitchen dishes, refrigerator, sliding door ect. When you shower no matter what you do to avoid the water getting out it gets out and floor becomes a big mess!!!! Water everywhere. Not sure what is going on but in this property at this time the beach is not what you expect, there is so much seaweed you cannot get in ( I really wish this would’ve been brought up to me, as we were looking forward to going to the beach and relaxing) and smells horrible. Location is great, but needs alot of work. Obviously you forgot to mention you broke one of the chair beds by not following instructions to leave open. I did not charge the damage deposit. We go with 2 kids (11 and 18) and sometimes another 18 yr old joins us. The condo was repainted/ bathroom renovated in December. As far as the seaweeds, those depend on the currents of the sea, it's rare, usually lasts a few days and common after storms. My housekeeper dropped in to clean mid way and said you were a filthy guest. I have never seen bugs but it's the tropics and they live there. Usually when people are dirty and eat on beds, leave crumbs, they come. Loved the location, not only for the beautiful ocean view but also for the very nice hotel and its staff, the pools are amazing, the restaurant is good, and the staff make you feel welcome and safe. The apartment itself left me wanting a little more. The bathroom is split up into a vanity area and then a separate area that has its own door for the shower and toilet which is very small. Everytime you take a shower this small room will entirely fill with water and never seems to dry. We spent our 4 day trip with wet floors and is really annoying when trying to just use the toilet. The room did have everything we needed like plates/utencils.etc which was real nice. Little extras could have gone a looong way like nicer towels, nicer pillows, and a comfortable bed. Otherwise we had a great time and were able to enjoy the homeaway. Thanks for update, I have notified my manager. However I would have appreciated if you had communicated this to me DURING your stay. First of all, the owner was extremely gracious and accommodating regarding my travel schedule. The condo has everything you’d need and is perfectly located near grocery stores, shopping, entertainment, restaurants, etc. No need for a car! The pools were amazing and the private beach was ideal. Very attentive staff and the grounds were kept clean and very safe. Highly recommended! Thanks so much Donald! Hope you come back! Beautiful view and cozy condo! why 5 stars? because the view from the place is GORGEOUS! I loved waking up to the sound of the waves and we really enjoyed sitting on that balcony. Its perfectly located, walking distance to anything you need. Condo is small, but very cozy. Kitchenette has just what you need for breakfast, smothies, or complete meals. The staff is great, the pool has amazing views, and there was always chairs around the pool available (unlike other places) Mariela was great and always replied promptly to our questions. She also had great suggestions and she is very knowledgeable about the area. We hope to be back with our kids soon! Thanks so much for great review Denise. I hope you come back with your kids, ours love it! The property was clean, safe, and absolutely stunning! The pools were amazing, the pool bar (and bartenders) were incredible, and the beach that led down from the area was well maintained and supervised. The restaurant had good food and drinks! The staff were so nice. The massage staff were a repetitively asking for our service which was slightly annoying at times but nothing to be worried about. The pool area had enough sun and beach beds, along with great bar service. Would have preferred more umbrellas and the ability to use beach towels (only for permanent residents). Overall would absolutely go back!!! Thanks for great review. Actually the towels are for guests staying in the hotel rooms, not the permanent residents (owners). I had indicated this on my renters' info package.